I know it’s been awhile since I last shared a FODMAP friendly dinner, but I haven’t forgotten you low FODMAP folks! Promise! One of my goals for 2018 is actually share more low FODMAP meals. Since it’s still a fairly niche diet, finding compliant recipes isn’t always easy – it definitely wasn’t easy when Mike had to eat low FODMAP. Ultimately, I’m just so happy that my recipes have been helpful to people. I’ve gotten so much positive feedback from people who were finally able to eat something different without the usual IBS pains to follow. 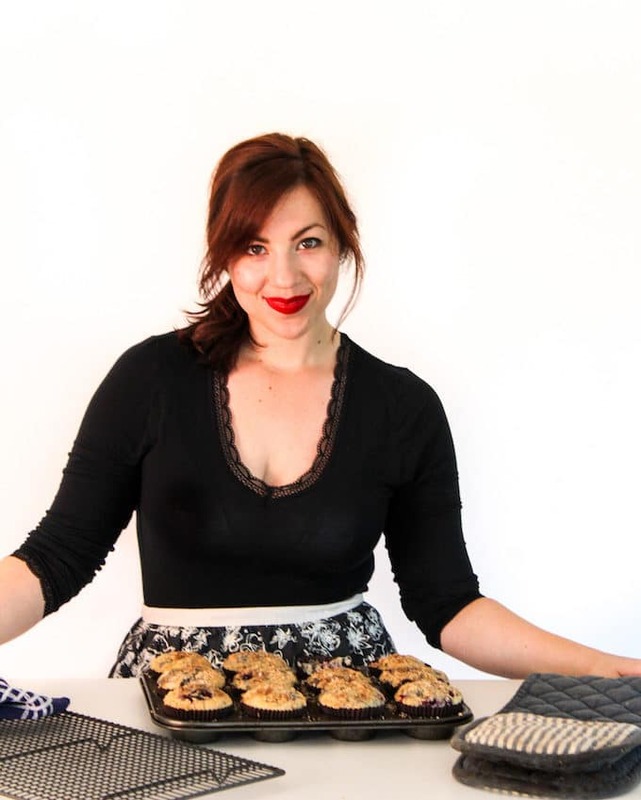 From one home cook who’s just trying to make tasty, allergy friendly food to another – I’m just here to help! And I mean….it’s 2018. No one should have to survive on plain old chicken & rice because of their dietary restrictions. That’s just sad and unnecessary, ya know? I feel like I’ve said ‘FODMAP’ far too many times in these past few lines so let’s just get to it already before I become even more repetitive. Right! 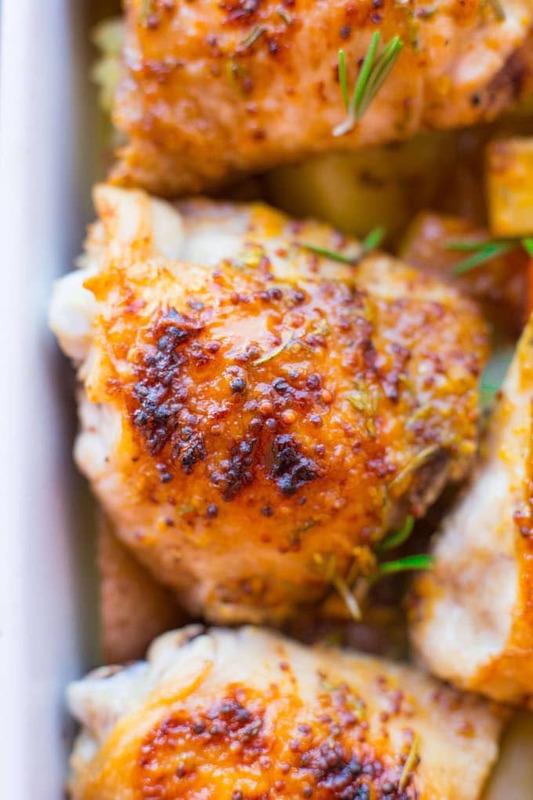 10 ingredients + 1 hours is all you need to make this low FODMAP maple mustard chicken dish. Start out by throwing your prepped potatoes & carrots in a large cooking pot and cover with salted water. Bring to a boil for about 10 minutes to soften up the veg before your final bake. This will allow for a faster cooking time in the oven later with all the chicken and sauce. To make the chicken, start out by score the top of the skin in a few different places with a sharp knife. Basically you’re just poking little holes in the skin to help the fat render out easier when frying which ultimately leads to crispier skin. It only takes seconds but it makes such a huge difference in the end. Once scored, lay the chicken pieces skin side down on a large, cold pan and warm to a medium high heat. Fry on both sides, about 4-5 minutes or until the skin turns a lovely, golden colour. Since you’re going to be finishing everything off in the oven later you don’t need to worry about the inside of the chicken cooking through just yet. While the chicken in crisping up in the stove top begin working on the maple-mustard sauce. Simple mix together the remaining ingredients in a small bowl and set aside until you’re ready to put it all together. Once the veg is par boiled and the chicken is browned it’s time to bring it all together. Spread out the potatoes and carrots across the bottom of a large, rimmed baking dish. Place the chicken thighs over the top, leaving the skin side up. Carefully spoon the maple-mustard sauce over the top of each thigh, spreading it around to cover the sides. The sauce will form a sort of caramelised crust while baking. Scatter a few extra springs of rosemary over the top to spruce it up a bit and then throw it in the oven and bake! Since both the veg and the chicken is partially cooked this should only take about 25 minutes. Low FODMAP or not this dish is a simple, straight forward meal that packs in a lot of flavour. If you’re interested in finding more FODMAP friendly recipes make sure you check out my Recipe Index. From there you can choose to view only Low FODMAP recipes under the “By Diet” section and then use the category section to break down what type of recipe you want to see (i.e. Main , Snack, Dessert, etc). Here’s to even more recipes in 2018! 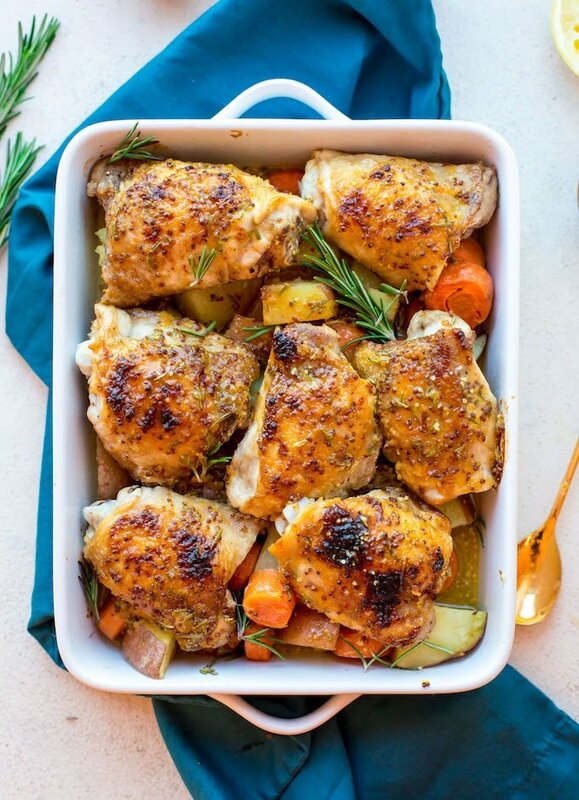 Don’t forget to #asaucykitchen on instagram if you try this Low FODMAP Maple Mustard Chicken! I’d love to see what you make with it! You can also post your pictures to my facebook page! 2 large carrots, washed and cut into 1-2 inch pieces. Preheat the oven for 375°F/190°C and lightly grease a large, rimmed baking dish. Add the potatoes and carrots to a large pot and cover with salted water. Bring to a boil and cook for 10 minutes. Then drain the water and add to your prepped baking dish and set aside. While the potatoes & carrots are boiling begin on the chicken. Use a small knife to prick about 3 or 4 gashes in the skin of the chicken. This will help render the fat of the chicken while cooking and make the skin crispier. Sprinkle the thighs with salt and pepper. Place the thighs, skin side down on a large, cold non-stick skillet. Turn the heat up to a medium high and cook for about 4-5 minutes or until the skin is nice and golden. Flip, and cook the other side about 3-4 minutes. While the thighs are cooking on the stove top prep the maple mustard glaze: in a small bowl mix together the mustards, maple, lemon juice, olive oil and rosemary. Taste and season with a little more salt and pepper if you see fit. When both sides of the chicken is browned transfer to the prepped baking dish and lay out the chicken on top of the carrots and potatoes, skin side up. 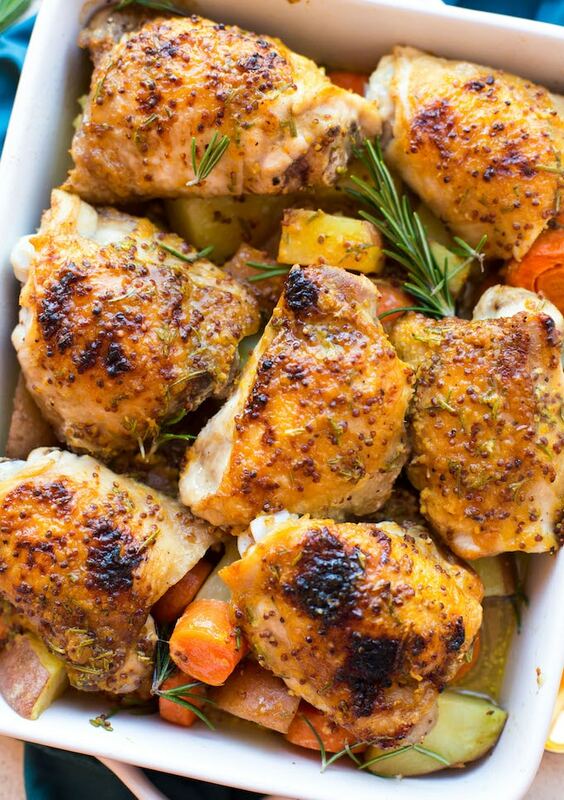 Spread a spoonful of the maple mustard mixture on top of each chicken thigh. Spread it around to cover the thighs as much as possible. Add a couple extra sprigs of rosemary if you wish and then place your dish in the oven. Bake for an additional 25-30 minutes or until cooked through: an internal temp of 165°F/75°C. Remove from the oven and let cook a few minutes before serving. Keep in mind if you are interested in keeping this Paleo that you need to make sure to double check your labels to verify it's paleo friendly. You should also check that's also low FODMAP since a lot of mustards often contain garlic. Thanks for the recipe. So many good comments I was looking forward to tasting this dish. Sorry to break the chain but I was disappointed with the mustard flavour and also didn’t like the potatoes. Next time I’ll make it without them and instead use zucchini, carrots, lemon, rosemary, just a touch of the maple syrup, and serve it over Tinkyada brown rice pasta spirals. That’s alright – to each their own! Your changes sound like they’d make for a lovely dish! It was lovely. My husband really enjoyed it. Thanks Veronica! Glad you guys enjoyed it! What cano substitute for the mustard? Hi Cathy! I’m afraid I don’t have any good suggestions here. I made this recipe using mustard as the main ingredient/flavour – If we get rid of the mustard we’d have to also alter the other ingredients and I’m not sure how much would need to change without testing it first. Sorry I couldn’t be more help here! Absolutely delicious. We ran out of rosemary so I replaced it with savory. It was still amazing. Definitely putting this on the regular dinners for my family and I. Thanks Christina – so glad you enjoyed it! Hoping to make this tonight for my low-fodmap roomie, but he doesn’t like bone-in meat… Would chicken breasts work okay for this recipe? It sounds sooo good, and we already have most of the ingredients on hand! That would work! You don’t need to worry about searing the chicken to start with but other than that you shouldn’t need to change anything else. Hope you guys enjoy! Made this tonight. My husband does low-FODMAP and it is always a struggle to find delicious meals to cook. This will definitely be going in the rotation! Thanks so much for sharing the recipe. Thanks Katie – so glad you guys enjoyed it! I made this last night with my husband, and we loved the tasty results. I was unable to find whole grain mustard without garlic though. Do you have any recs? Hi Lydia! I’m so glad you guys liked it – thanks so much for coming back to let me know what you thought! As for the mustard I usually buy the Maille brand which is garlic free. If you live in the UK I know the sainsbury’s brand whole grain mustard is garlic free as well. Hope that helps! This was very good! I substituted in maple mustard for the two mustards listed, used chicken breasts instead of thighs, and left out the lemon juice since it bothers me. My husband and son both enjoyed it, also. I’ll be making it again! Thank you for your recipes. Eating is very frustrating for me at times, doing low-FODMAP as well as wheat and dairy free from necessity. I appreciate easy, healthy, and good! Hi Carrie! So glad you all liked it! Thanks so much for coming back to let me know what you thought! Yum!!! Looks and sounds divine!